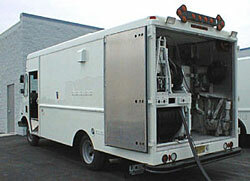 The rugged reliability of Step Vans makes them perfect for severe TV, grout seal and test, or cutter operations. They are available in 16, 18, and 20 foot lengths with a standard 14,100 GVWR rating. Step Vans can be configured as described for Box on Chassis and Hi Cube Trucks. Aries Industries, Inc., N63 W22641 Main Street, Sussex, WI 53089. Tel: 262-246-3900; Fax: 262-246-7099.